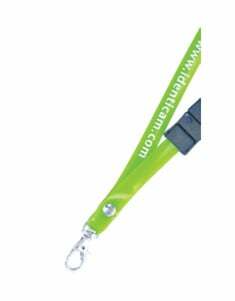 Help Control Infection with this silicone lanyard that can be wiped with disinfectant. Wipe them one or twice a day, and immediately after any contact with contaminated material to help prevent the spread of infection. They can be customized in any color or any length (36" is standard) and are available in 3/8", or 5/8" widths (5/8" shown). Choose from a variety of clip attachments to suit your needs. 3-breakaway style also available.